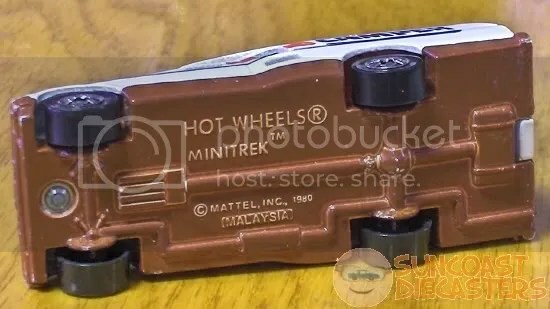 This is the rare white Minitrek with brown base. 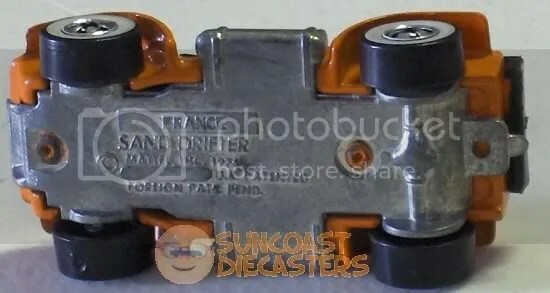 There are six other variations of this casting: two from France, two from Malaysia, one from Mexico and one from Hong Kong. 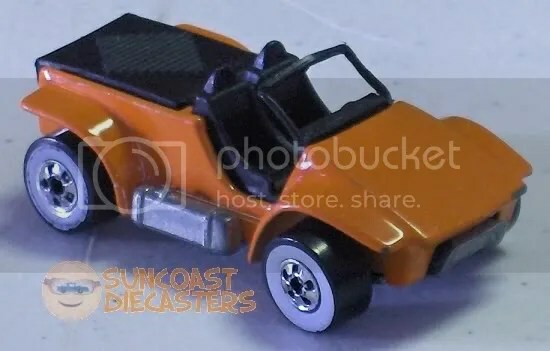 Rare T-Bucket from the Park ‘n Plates series. 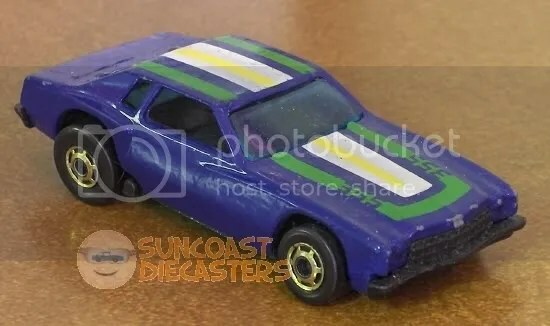 This Blown Camaro was only issued in the Turbotrax Turboglo set. 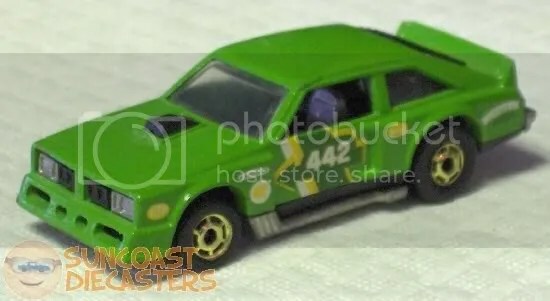 This Flat Out 442 was only issued in Canada. 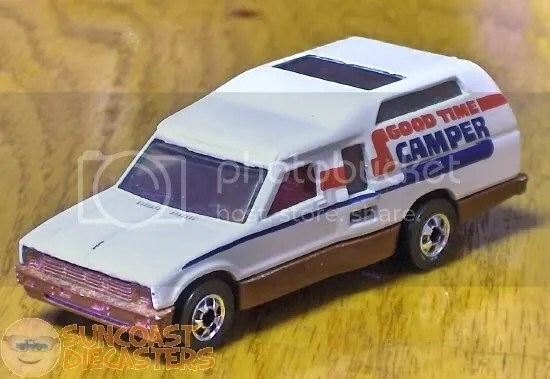 There are three rare variations of this XT-3 casting. This one in black with yellow flames and canopy; a white variation with yellow flames and blue canopy, and a black one with a black canopy with yellow flames. All three are hard to find. 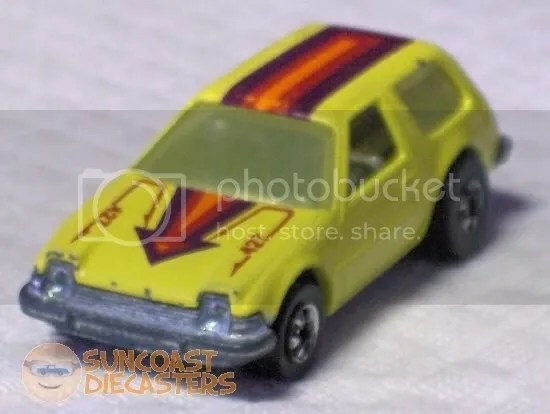 This variation of the Packin’ Pacer is from Mexico. 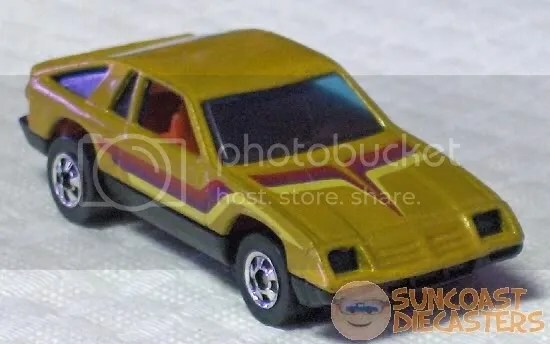 This variation of the Omni 024 is also Mexican; very similar to the metalflake gold version,except it has reverse tampos and is not metalflake. 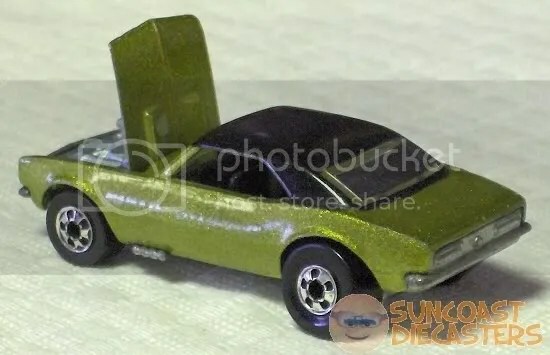 This ’67 Camaro was in the special 15th Birthday offer only. 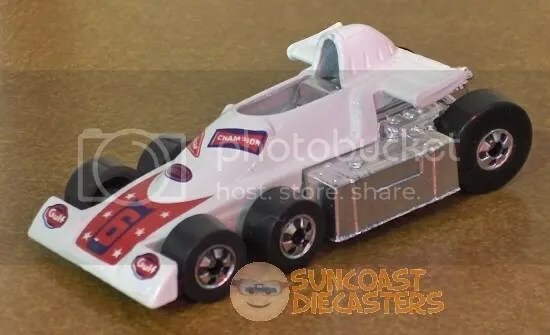 This variation of the Porsche 917 has the word “Porsche” twice on the hood. 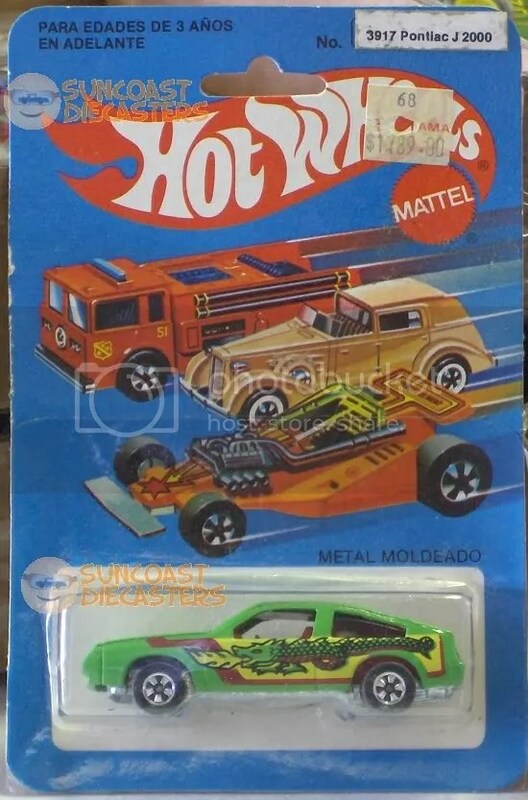 This is the rare Lowdown from Mexico. There are two variations: this one with the black plastic base, and one with a chrome plastic base. 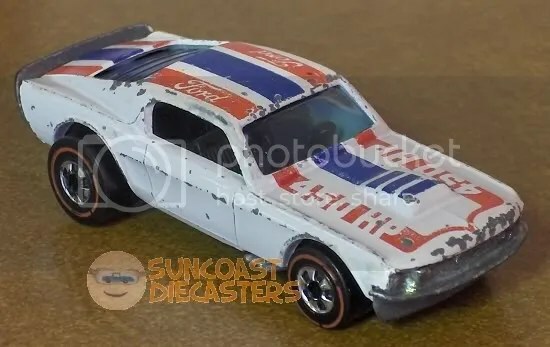 This is the rare alternative white Mustang. 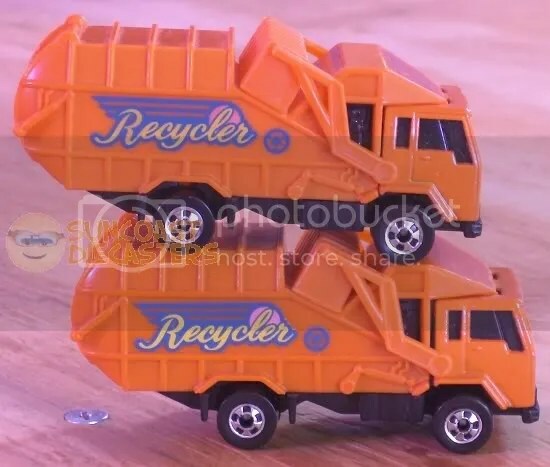 There are two other versions from Hong Kong, both in yellow: one with red and blue stripes, and the other with yellow,orange and magenta stripes. This is the rare white Lickety Six from Mexico. 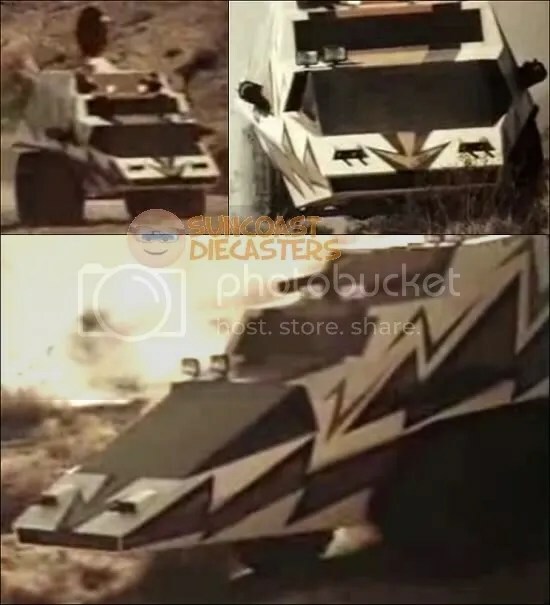 Since it’s extremely unlikely that you’ve seen MegaForce, here is a collage of shots of the working vehicle from YouTube clips. 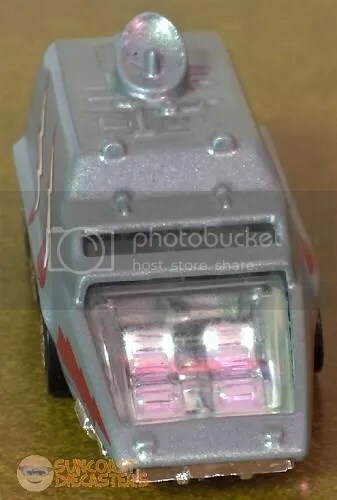 Now this is a true rarity, and Bill is an extremely blessed man: this is the original MegaForce TAC-CON, on the original backer! Drink in and enjoy. 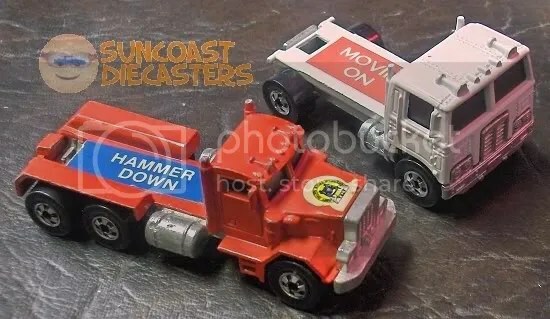 The two rare semi trucks available only in the Great American Truck Race set: Hammer Down and Movin’ On. 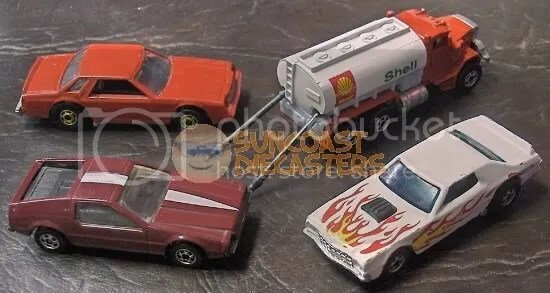 The Mirada Stocker and Turismo on the left are from France; on the right, the Shell gas truck is from India, and the Fireball Torino is from Mexico. (UL) Rare yellow-&-flames ’57 Chevy with exposed engine and blackwalls. (LL) ’56 Hi-Tail Hauler in blue with black motorcycles; (UR) Baja Breaker with olive tampo on sides; (LR) Red Poison Pinto from the “Speed Machines” series. 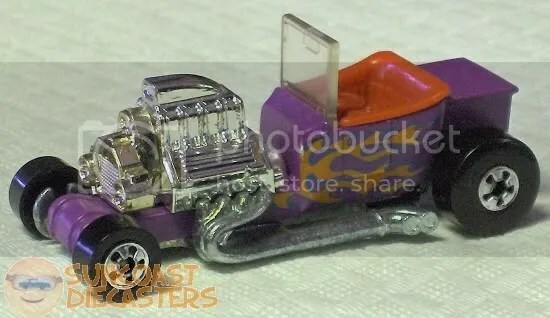 Brown Hot Bird; white Purple Passion from the Hot Wheels City Mini Market; and the MegaForce Mega Destoyer, in excellent condition. 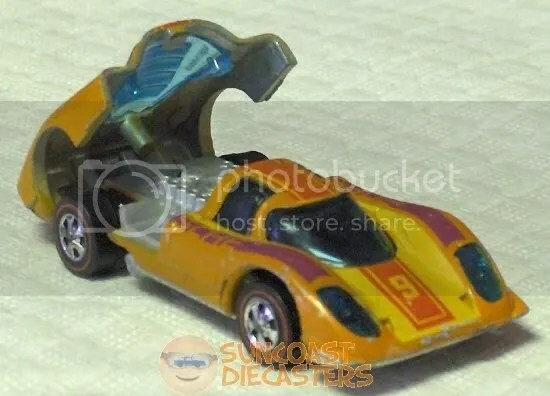 This Second Wind and Z-Whiz are from the Speed Machines series. This Fiat Ritmo and Z-Whiz Datsun are from France. By the way, Bill had me goin’ for a few minutes there. He showed me the model and said he’d never heard of a “flat” Ritmo. I examined it with my loupe and told him it said “Fiat”, not “flat”. His mouth started curling up in a wry smile, and I realized I’d been fished. 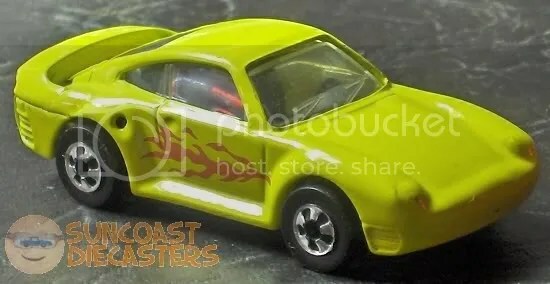 This Porsche 959 was only available in the Parking Garage set in 1995. 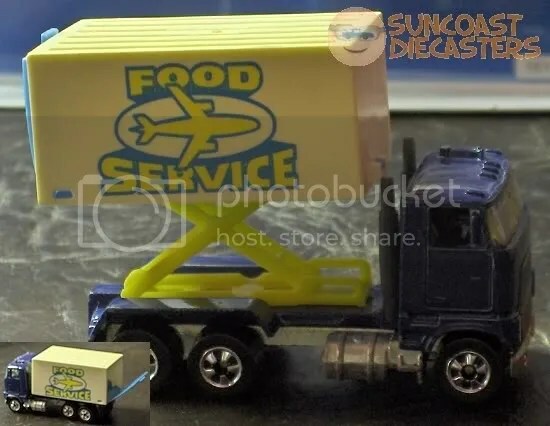 This very rare Food Service Truck was only available from France. Dig the cool articulated lift, and (in the inset) the opening rear door. 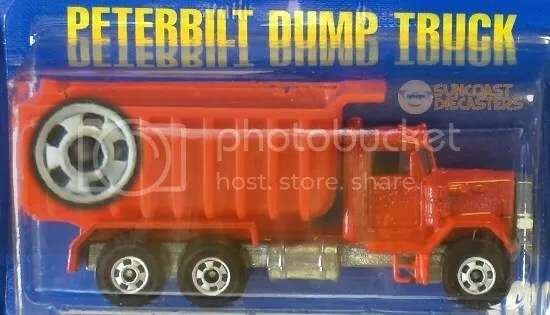 Mattel: Y U No make stuff like this no more? Bill continues to prove himself to be the Viscount of Variations. Here he’s acquired the Peterbilt with rare frost-white wheels. Yes, check the inset – those wheels aren’t silver, they’re frost-white. Mexican Pontiac J-2000. Bill actually got this in January, but somehow it never got in front of my camera. Very international version of Highway Hauler. 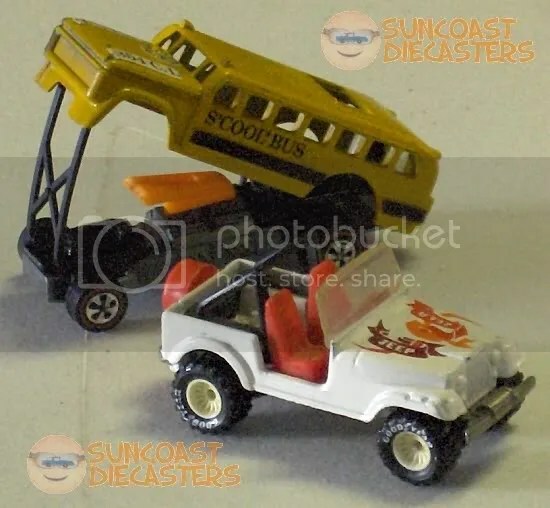 Original Heavyweights-era S’cool Bus; rare white-wheel Jeep CJ-7. 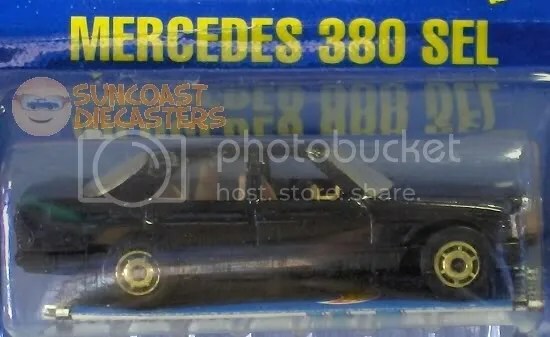 Rare gold-wheel Mercedes 380 SEL. 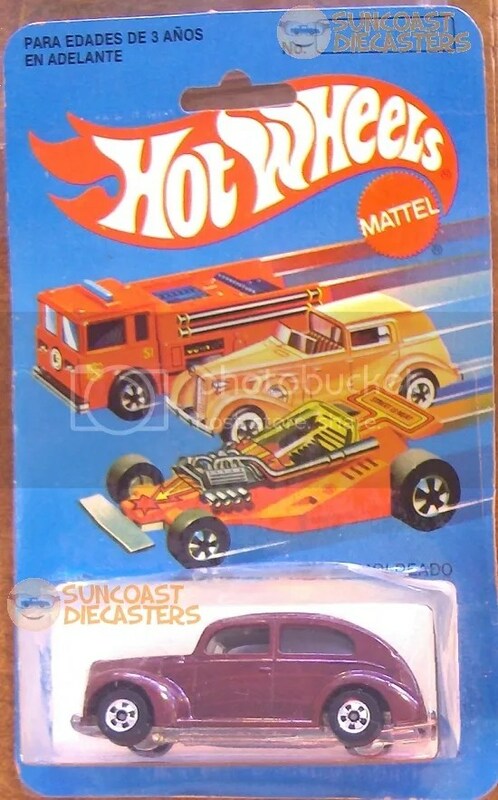 Extremely rare France-edition whitewall Sand Drifter. Look! It even admits it’s from France! Oh, me, oh, my! What does it take to make The Ken jealous? 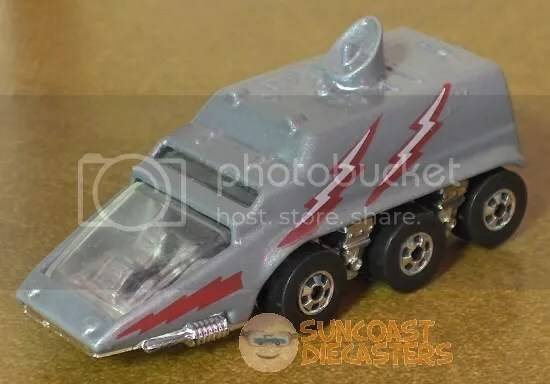 How about this gorgeous garbage gatherer, fresh from the Redline days – the wonderful, wonderful Waste Wagon! Bill Has done hisself proud with this fine catch! …And here’s a nice, artsie-phartsie photo for you! With the warmth of mid-July, the rare and magnificent Truckus garbagicus begins its graceful courtship dance, thus ensuring…Ha. Got all scientifical on you there. No, of course this is yet another of Bill’s variation captures. 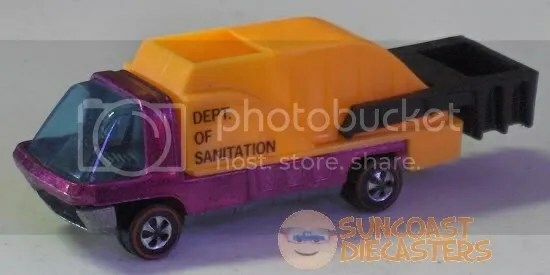 Note that the tampo on the upper trucker seems duller and darker than that on the lower lorry. Also, the windows and bumpers of The Above seem more reflective than those of The Below (although that could be a trick o’ the lighting). Bill isn’t sure if this is a true variation or a production error; but, since even errors can be the focus of a collection, Bill’s own collection may have just gone meta: a variation on variations. Bill picked this up at our October ’12 meeting. 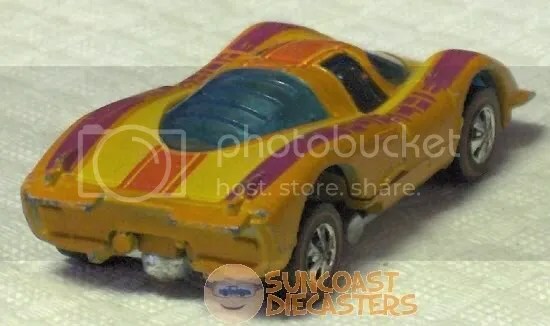 This is truly among the Rarest of the Rare when it comes to Hot Wheels: this is Superfine Turbine, one of Larry Wood’s classic crazy customs. (This is the fluorescent lime green version, specifically.) 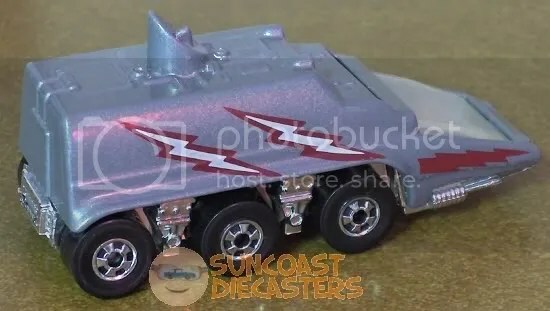 How rare is this model? ; does “the casting was only produced for the 1973 line” sound rare enough? 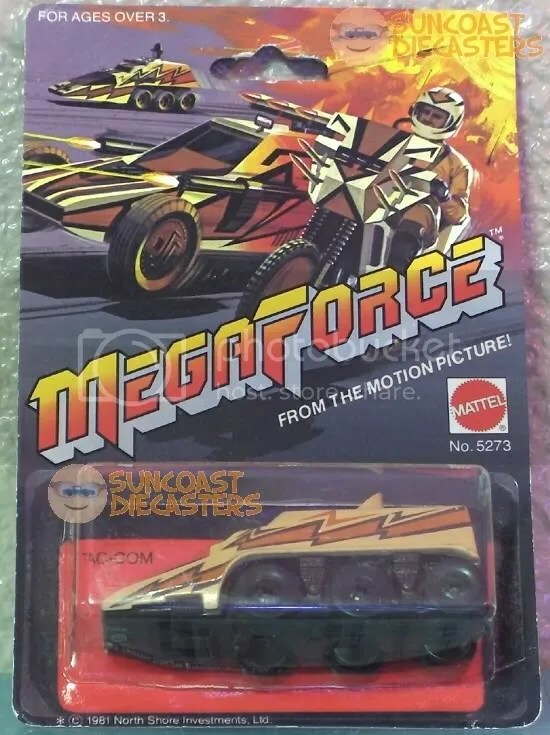 Bill scores again with a MegaForce rarity. 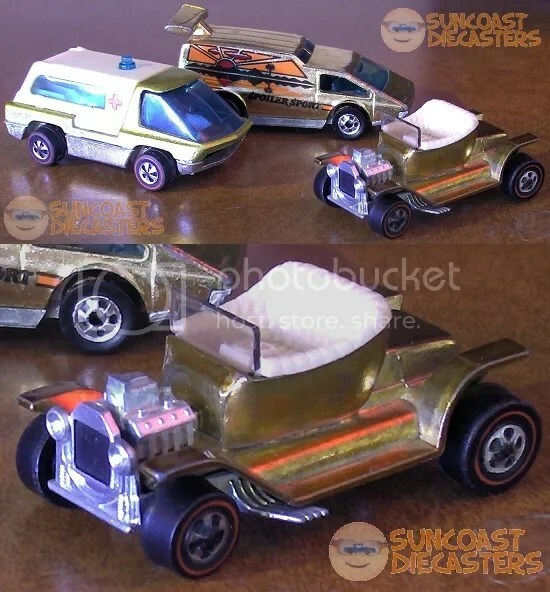 This model came in two versions: one with the bike in tan plastic, and this one with the chromed bike. Note also that the chrome is still nice ‘n shiny here. 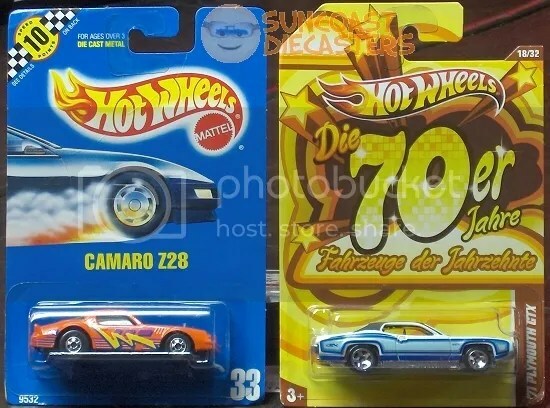 Bill added this rare blue-card edition of the Camaro Z28 to his collection; the German-card ’71 Plymouth GTX is a RAOK from me. Señor Bill locádo los moldeado “Fat Fendered 40” de México. Mucho calíenté! Bill really goes for the gold here. 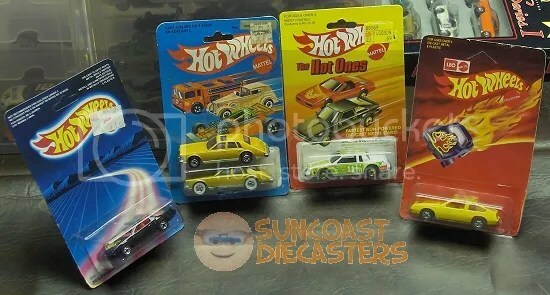 An original Heavyweights ambulance; the Golden Machines 6-Pack edition of Spoiler Sport; and the highly rare Hot Heap. Just drink in that wonderful ’68-era heapness. Bill’s Matchbox(!) purchases: Hi-Tailer and, um … a ’49 Edsel, maybe? 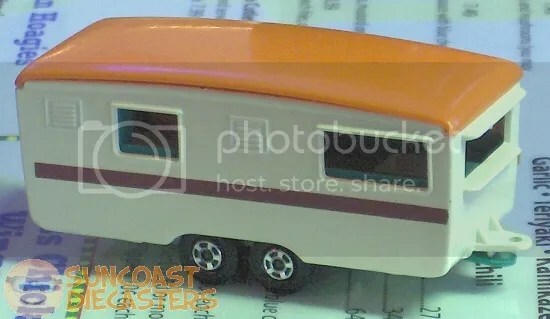 Bill also bought the very stylish Trailer Caravan. Bill acquired several cars in April, including the “small sun roof” variation of the Pontiac J-2000. 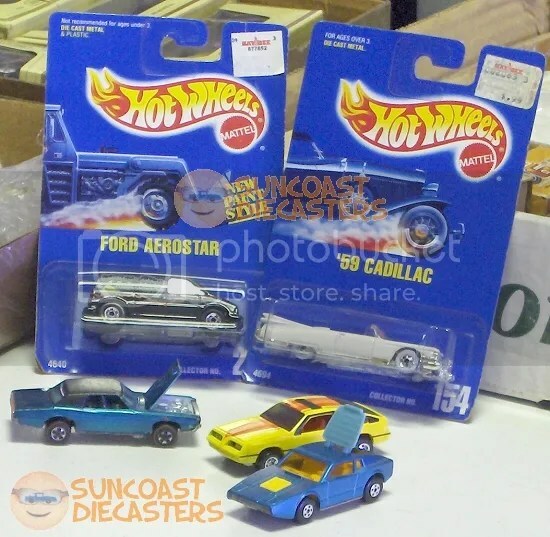 I wish I could identify those two MOC cars in back, but … I dunno … I just can’t seem to figure ’em out…. Several items for Bill’s gallery, among them the very nice 25th Anniversary 5-pack. 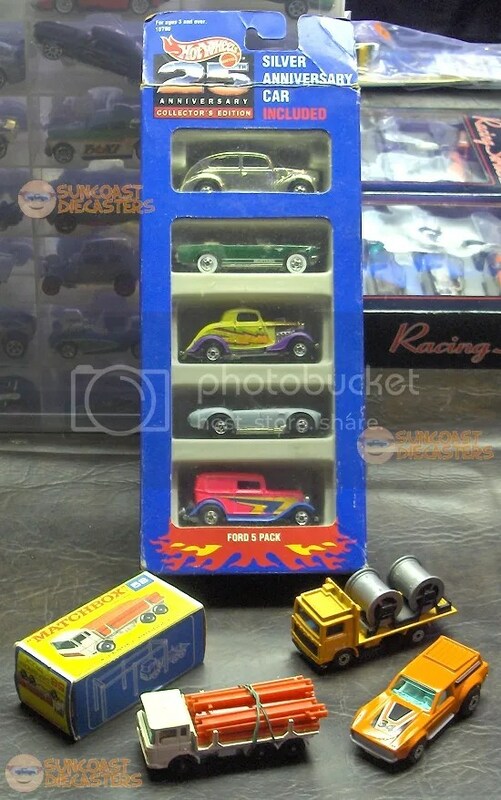 Check out also the very cool, and truly “old school” Matchbox flatbed. It’s carrying its own little garage. Well, sort of. The “girders” (or “I-beams”) on its bed actually assemle to make a little hidey-place for the truck (albeit one with out walls or covering of any sort). 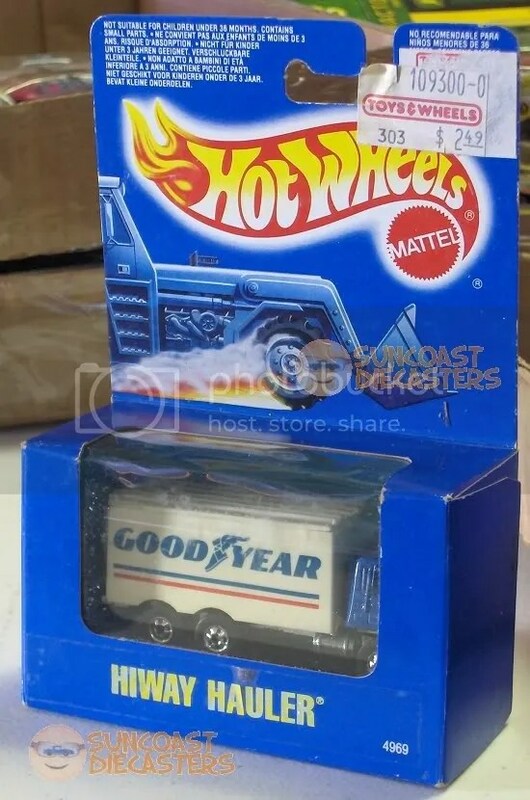 There’s an illustration of it on the box (yes, kids, back in the old days, toy cars and trucks were in boxes, you know, like normal products). I should’ve included a shot of that diagram — maybe, of you’re nice, I’ll add one later. 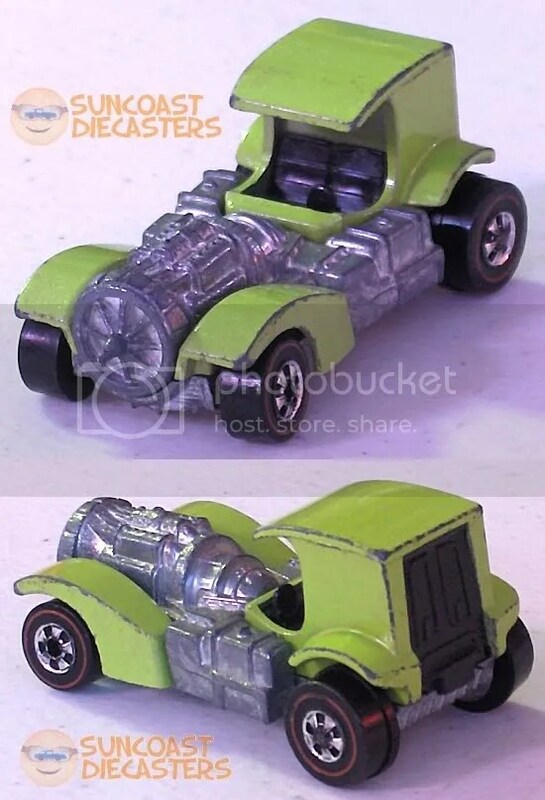 …It’s specifically named “Mountain Dew Stocker”. 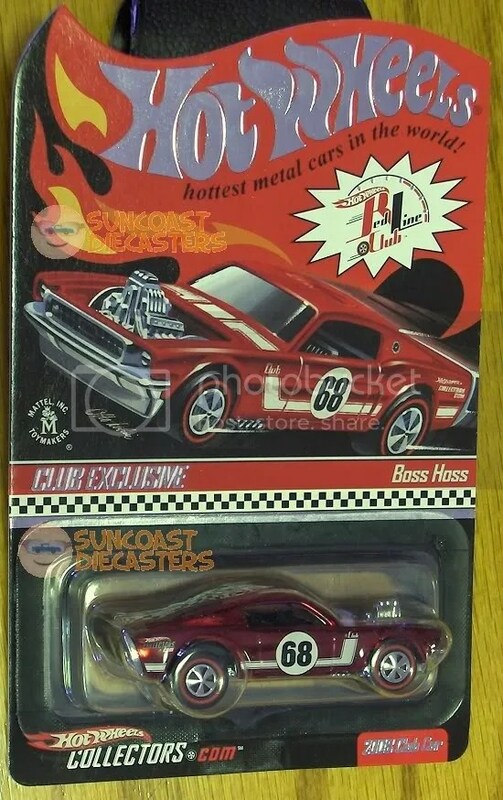 While there were a few variations of this Hot Ones release, only this one had this particular chassis.